As I mentioned on the Hello Kitty flash drive post I think USB heart pendants definitely qualify to woo women. To juice up the romance, you could even store some meaningful data on them. A simple “I love you” poem in stylish font or an animation of two lovers walking hand in hand into the sunset is bound to boot up her heart drive. Or you could get really creative and inscribe your memory stick heart with an own recorded mp3 song, oozing out how you feel about her. And if you’re ballsy enough you could include the secret video you took when the two of you were making out before. Let me know what works best! p.s. 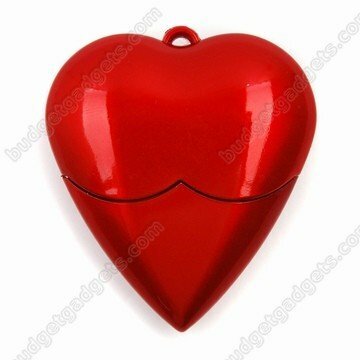 : Of course heart shaped flash drives would make great gifts for any loved one, not just the person of your desire. Don’t you think? I love the heart shaped USB drive and would seriously consider buying it for my girlfriend for Valentine’s Day except that it would need to be attached to some flowers or very nice chocolates otherwise I’ll get punched for being too much of a nerd. Now that would have been such an awesome gift for valentines to a computer guy or girl. Really cool. Thanks a bunch. I love your USB necklace posts. its inspiring to see the creativity that it takes to make these. keep sharing the geekery!! Very cool, I have to get one of those for my girlfriend so she can copy all her mp3′s from my computer to her ipod, I’m sure she’ll love it. What a great gift for your new girlfriend if she is under 20 years old. Necklace that is looking like that is something even I could were. For me the valentine’s day is no so important, I think the anniversary days of the relationship are a lot more important and meaningfull. The heart usb flash disks are so cute. These are great as gifts for women. They are quite fashionable. These heart flash drives are so cool. You can give these as gifts to anyone. Heart signifies love, and these heart flash drives say it all. I love these ideas! Especially the heart with the diamonds! That is really cool! The heart shaped flash drives are awesome, my g/f could actually wear is round her neck if she wanted to as a necklace! Such cute flash drives. I would wear one of these around my neck because it looks fashionable not geeky like regular flash drives. These are so cool. I always have a USB flash drive hanging round my neck and it looks so boring. Jazzing it up as a pendant is a great idea. .-= Karl @ wedding photographer richmond´s last blog post ..Introducing GrantDeb Photographers Senior Ambassador 2011 – Amanda =-. I would love to have one of these. These are better than those boring flash disks. They’re fashionable too. 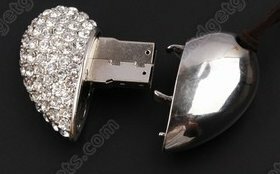 These usb jewelries is the greatest idea to buy as a gift for my girl. And the prices are unbeatable. Thanks for this wonderful idea. .-= bill@usb sound card´s last blog post ..Internal vs External Sound Cards =-. Lovely idea – very creative. Will be getting one over the holiday season! .-= Simon @ USB Sound cards´s last blog post ..THX TruStudio PC and THX Trustudio Pro in PC Sound Cards =-. Heart shapes are always cute, aren’t they? thank you very much, this is a great idea and a wonderfull gift for my women! Are they able to transfer at USB 2.0 speeds?? all of these are USB 2.0 so they should have the standard speeds – probably around 15 MB/s read and 10 MB/s write. When you check the individual listings you should find more information. USB jewellery, what a great idea! This could be loaded with memories, pictures and video of you and your girlfriend or wife together as an anniversary gift. Also, I wonder if these ever turn up as post wedding gifts containing wedding videos and pictures.